For the 30th round of La Liga, the so-called Spanish Primera Division, meet on April 04 at 19.30 clock, the Sevilla FC and Deportivo Alaves each other. A clear favorite is not recognizable in this pairing, because the first leg ended in a 1-1. In addition, the opponents from Alaves prove the fifth, while the team from Sevilla holds the seventh place. On this page you will find a bet tip, a prediction and prediction of the game as well as an analysis of both teams. We also inform you about the most lucrative betting options, for which we used the odds comparison. Can Sevilla win against Deportivo Alaves? For the team from Sevilla it has been going downhill since the 13th matchday. In the last three rounds in the Spanish highest football league, however, they could set accents. After losing three games in a row, they beat Real Sociedad 5-2 and Esp. Win Barcelona 1-0. Against Valencia, the table neighbors, they lost 0: 1. Because of the performance of the entire season, the club had separated from Coach Machin. It was replaced by Joaquin Caparros on 15 March. Two games they have so far denied under the 63-year-olds. What they once could win and once lost. Caparros was previously Sport Director from Sevilla. A few facts about the home games: Eight of 15 games they could win and three decide in a draw. As many games were lost. In these home games, they met 27 times and allowed only 15 counter. Even if they were not really convincing for the entire season, Wissam Ben Yedder can look forward to the title as fourth strongest scorer in the league with 16 goals. Pablo Sarabia, meanwhile, shared most of Sevilla’s goals with nine assists and scored ten goals. However, some injured players have to complain. This includes Nolito, Maximilian Wöber, Sergio Escudero, Pablo Sarabia and Tomas Vaclik. In addition, Ever Banega is blocked because of too many yellow cards. Under these names, the goalkeeper and the strongest player to find templates. This could well affect a bet tip. For the hosts speaks with certainty that they could win almost all home games against Alaves. Only once they lost to Deportivo and once a draw was scored. They scored two goals in each match, while only allowing seven. Therefore, one can almost assume that they will also decide this game for themselves. 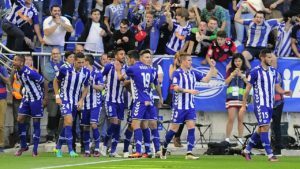 Can Deportivo Alaves win against Sevilla FC? The team under coach Abelardo can look back on a good season so far. Only abroad does not seem to work out yet. Six out of 15 games were won away and two draws were scored. Seven games ended, however, in a defeat. The 1.13 point cut is not convincing either, as it means that they only finished 17 times, with 23 points taken. However, they have not lost the past three away games. Two wins and a draw were possible. In the last three rounds, they were also quite convincing, except for the match against Atletico Madrid. This ended with a 0-4 defeat. Previously, they were able to win against SD Huesca with 1: 3 and achieve a 1-1 draw against SD Eibar. In the upcoming match they have to give up because of a yellow card suspension on Manu Garcia and injury due to Burgui and Guillermo Maripan. However, these failures are not likely to be too severe, at least they are not really relevant for the bet tip, as the flagships in the team include Jonathan Callerie and Jony, as well as Borja Baston. They provided for most goals as well as assists. In their last ten meetings with Sevilla FC, they were only three times successful and only twice was a draw possible. They only managed nine points, while Sevilla met 13 times. These facts do not speak for a tip 2. 1. Latest news before playing bets on Sevilla vs Alaves. He had a better run than expected in the championship and was also involved in the Europa League matches. Meanwhile, he ended his European adventure, being eliminated by Slavia Prague with a 5-6 overall score! Now he focuses only on LaLiga, being 4 points in 4th place, the last one leading to the Champions League next season. With a victory in this game they will overtake both Valencia and Alaves and will climb to a single point behind Getafe, the team that drew at this stage. He is an adept at the offensive game, proving the 22 goals scored in the last 10 matches on his own field. Ben Yedder is in great shape, being in fourth place in the top scorer, after Messi, Luis Suarez and Stuani. Ever Banega is suspended for the cumulus of yellow cards, while Nolito will be missing because of an injury. I am incomplete to rebuild another 5 players: Vaclik, Escudero, Andre Silva, Mercado and Wober. He made a season over expectations so far, being very close to historical performance, qualifying in the Champions League. However, it seems that the pressure of the points puts its mark on the evolutions of the players. In the last stage he gave 0-4 on his own field with Atletico Madrid, the most severe defeat in the current season. Also with 0-4 lost in the move from Getafe, while Santiago Bernabeu won 3 goals, also in games played in 2019. Coach Abelardo faces 3 important problems, getting injured on Maripan and Burgui and suspended for the cumulative yellow card on Manu Garcia. We also find the striker Andrei Lupu, a 21-year old Romanian player, who has not played a minute for Alaves. 2.Seville vs Alaves teams likely. Sevilla (4-4-2): Soriano – Navas, Gomez, Carrico, Vidal – Vasquez, Gonalons, Mesa, Sarabia – Promes, Ben Yedder. Alaves (4-3-3): Pacheco – Aguirregabiria, Navarro, Laguardia, Duarte – Brasanak, Pina, Wakaso – Inui, Calleri, Jony. In the championship tour was 1-1, Jony’s goals for Alaves and Ben Yedder for Sevilla. The summary of that party you can see HERE! Sevilla has only wins in the 5 straight home matches over the last 20 years. On average, Sevilla scored two goals per game in Alaves’ gate in the games on “Ramon Sanchez Pizjuan”. We would stick to a tip of 1 and in addition give a tip 1 half time 2. This has been the case more often. Although Sevilla’s season has not gone as far as they wanted, they have often won against Alaves. For the brave, we would recommend placing them on a No with both teams because Deportivo has not always met in direct encounters. 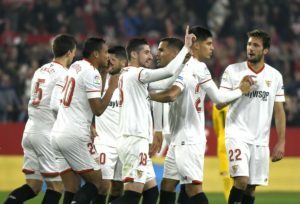 Even if the two teams are neighbors, Sevilla does not conceive anything other than victory, the only one that helps her go up to fifth. Caparros’s own field play is a very open one. Sevilla creates many goals and on average scores over two goals per game. Alaves is doing well with the small teams, but he has succumbed to all the top-ranked duels this year. And the guests play on the attack card even on the move, proof being the 6 goals scored in the last 3 external games. To be sure of victory, Sevilla needs at least two goals and has a great chance to score, especially as Ben Yedder is in great shape.